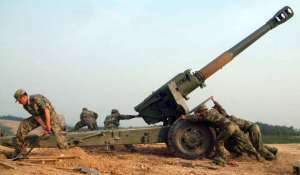 The PLA is currently deploying a large number of the Type 66 152mm gun-howitzer in its ground forces. First introduced in 1966, the Type 66 is a Chinese copy of the Soviet D-20. The Type 66 provides a reliable, lethal, long-range, direct or indirect firepower in the battlefield. The latest variant may also be capable of firing laser-guided ammunitions. Its self-propelled version known as Type 83 was first introduced in the mid-1980s. 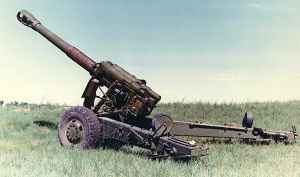 The D-20 152mm gun-howitzer was developed shortly after the end of WW-II by the F. Petrov Design Bureau in the Soviet Union. The D-20 first entered service with the Soviet and Warsaw Pack armies in 1955. 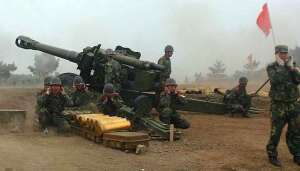 China began to copy the D-20 in the early 1960s, the resulting Type 66 gun-howitzer entered service with the PLA in the late 1960s. The improved Type 66-I was introduced in the 1980s, with an unknown number exported to Iraq during it’s the Iran-Iraq war. The PLA has also developed a self-propelled variant Type 83. The Type 66 is organic to army-level artillery divisions/brigades and to the artillery regiment of a infantry/armoured division. 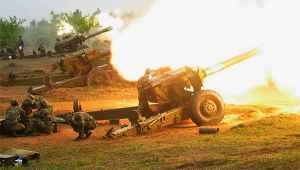 Each artillery division has a Type 66 regiment (54 guns); An infantry/armoured division has a Type 66 battalion (18 guns) in its organic artillery regiment. The Type 66 is operated by 10~12 soldiers. The Type 66 is a large, heavy gun mounted on a two-wheel carriage originally designed for the Type 60 122mm field cannon. The short split-trail carriage is distinguished by caster wheels (folded upward for travel) at the end of each trail; a prominent base plate connected to the bottom forward cradle; and a scalloped, winged shield with travelling central portion. The 29-calibre gun tube features a larger size double-baffle muzzle brake. The Type 66 has a two-cylinder recoil mechanism above the tube, and the gun tube is prominently stepped, with a semi-automatic, vertically-sliding, wedge breech block. The circular firing jack and caster wheels make it possible to rotate the whole gun swiftly through up to 360 degrees. It also has direct fire sights for both day and night and is capable of engaging armoured targets with direct fire. The crew is protected by a steel shield. It can be towed by truck or tractor. The Type 66 fires high-explosive fragmentation (HE-FRAG) rounds at a rate of 5~6 rounds/minutes, with a maximum firing range of 17.2km (possibly increased on the Type 66-I). China obtained the Russian Krasnopol laser-guided projectile technology in the 1990s, and has successfully developed its own 152/155mm laser-guided ammunitions. Designed to defeat armoured vehicles and weapon emplacements, the projectile has inertial mid-course guidance and semi-active laser homing. The projectile has a range of 3 to 20 km, and can hit a target by the first shot without registration.